A harbor on the Taunton River, a tributary to the greater Narragansett Bay of Rhode Island, was only part of the reason a textile­manufacturing center began in the village of Fall River. The most important factor was the fall of the Quequechan River 130 feet in the distance of 1⁄4 mile from the Watuppa Pond into the Taunton River. A rivalry for importance developed between the villages of Assonet and Fall River, which sat on either side of the Quequechan. The first location of textile development in the Narragansett Basin was north and west along the Blackstone River and the Pawtucket in Rhode Island. Samuel Slater started the first mill in 1792. By 1806, two small spinning mills were begun in Taunton, north of Fall River. The Swansea Factory was organized in 1806 for cotton spinning. In 1813, Dexter Wheeler and David Anthony joined with property owners along the Quequechan and organized Fall River Manufactory. In 1813, The Troy Cotton and Woolen Company was organized. This time during the War of 1812 was a time of great expansion in New England, when 62 mills were constructed. The British denied the new states the trade routes to Europe and textile goods of England and France. After the war, many of these mills closed when imports flooded the US market. The success of the Boston Company in Waltham, MA (1814) and the development of the Gilmore power loom in Pawtucket (1816) demonstrated that a new factory method was possible. Weaving automation finally caught up with power spinning. Large, powerful water sources such as the Merrimack River allowed Lowell to jump ahead beginning in 1824. 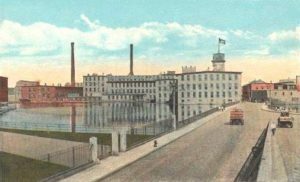 The Pocasset Company was organized in Fall River. By 1831, 21 manufacturing firms were listed in Fall River. By 1837, the number of spindles in Lowell eclipsed Fall River four fold, but Fall River was not finished. Specialization began. Production of print cloth and the print works flourished. Print cloth was finer than coarse drills and sheeting of the times, therefore this represented a step forward. The Robeson Print Works was in operation in 1826. Each mill usually supported a mill machine shop to build what was needed for the mill. The firm of Harris and Hawes was the first separate machine­building company. It was an outgrowth of the Pocasset Mill. Iron was also needed, as machines required more durable construction. Local bogs were mined; The Fall River Iron Works was organized in 1821. Entrepreneurs began to invest: Abraham and Isaac Wilkinson, brother­in­laws of Samuel Slater, Holder Borden, Richard Borden, Bradford Durfee, and David Anthony. These names became legend in Fall River. The Iron Works Group. A group of men organized and began to expand manufacturing. 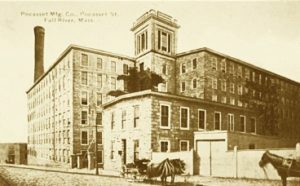 In 1831, Holder Borden leased the Massasoit mill of the Pocasset Company and operated it as a separate entity with 9,000 spindles, the largest in town. In 1833, the American Print Works was started and became the largest in America. Steamboats ran to Providence and New York, a rail connection was opened to Boston, Fall River Gas Works opened, cotton mills thrived. Between 1845 and 1875, 42 cotton mills with 1,268,000 spindles were in operation – twice the number operating in Lowell. Steam replaced water as the operative power. The shift from water power to steam gave competitive advantage to mills located to the south – coal was more available and the weather was milder. The conversion to steam was two fold. A scarcity of large, easily developed, conveniently located water power led mill owners to rely increasingly on steam and the steam engine became more reliable. The number of spindles in Fall River mills doubled between 1855 and 1865 and quadrupled by 1875. Union Mills Company, founded in 1859, thrived during this period. Less variable temperature and slightly higher relative humidity along the southern coast provided better running conditions for fine cotton yarn production. Lancashire in England was an ideal natural location; Fall River and New Bedford were both in coastal locations. Artificial humidification made real progress in the late 1880s. In 1879, the Garland Atomizer was described at a meeting. Owners often injected steam to humidify spring and weave rooms, much to the discomfort of operators, especially in the summer. The Rise and Collapse of Fall River. In 1875, Fall River was undeniably the leading textile center in the United States. By 1925, the peak was reached and a collapse followed soon afterwards. Smith, writing some 20 years later points to several factors, the main ones were certainly the rise of the South while Fall River slept, and the greed of owners who neglected to reinvest in new technology while declaring record cash dividends. As the South grew in these early years, the product grew in the direction of higher quality and finer yarns spun. Smith documents this with many statistics. The South had an advantage in labor costs, it is true. Strikes by Northern workers had to be a result of poor management techniques and the fact that labor saw their hard work resulting in bigger mansions for the owners rather than in payment as salaries. Workloads were a force in the calling of repeated strikes. The North also failed to modernize and replace mule spinning with ring and old looms with new. Labor unions probably fought such progress. Transportation costs were not as much a factor as one would think. Cotton was not being grown in the backyards of the Anderson and Spartanburg County SC mills. Most cotton came from the Mississippi delta region. The signs of collapse were there for all to see in 1909 and 1910. Only the War saved the industry… for a while. Collapse and Survival. Chapter IV of Smith’s book says it all. World War I saved the industry and records sales, and profits followed into the 1920s. The South had continued to modernize during the war and was in a much stronger competitive position once the war ended and the American public adjusted to a peacetime economy. Only one new spinning mill was built after 1912 and despite the profits made, the number of spindles added was less than 4 per cent. In 1922, prices for print cloth declined. In 1923, employment declined by one­third. Mills began to close in 1924. Iron Works Mill #6 and #7 closed and some people moved to Kingsport, TN. A fifteen­year decline had begun. Seventy­three mills with three­fourths of the capacity were liquidated. The Borden mills closed, American Printing and the last of the Durfee Corp., the last large print manufacturer. Some mills merged. The Berkshire Fine Spinning Associates was formed in the spring of 1929 as a horizontal merger of five mills located in western MA, VT and RI. United was reorganized in 1933. Fall River bleachery closed in 1939. Algonquin Printing was liquidated in 1941; Pilgrim Mills in 1942, even though it was heavily invested with the “modern” Northrop looms. Modern Falls River. It is difficult to document much of what is left. If one Googles “Fall River textiles”, the names of ten companies appear; two, however, are in nearby New Bedford. Duro LLP remains with two plants, and six other separate names appear. CHF Industries, Inc., a manufacturer of bedding and window dressings, announced a closing for late winter 2008. Quaker Fabric closed in 2007. Textiles today are a mere shadow of what was once one of the leading producers in the United States. Smith, Thomas Russell. 1944. The Cotton Textile Industry of Fall River Massachusetts: A Study of Industrial Localization. New York: King’s Crown Press. http://boston.bizjournals.com/boston/stories/2008/01/28/daily46.html CHF Industries closing. Accessed March 24, 2008. Wikipedia “Fall River, Massachusetts” Accessed March 24, 2008. Image: Peter Metzke, Melbourne, Australia. November 17, 2008.